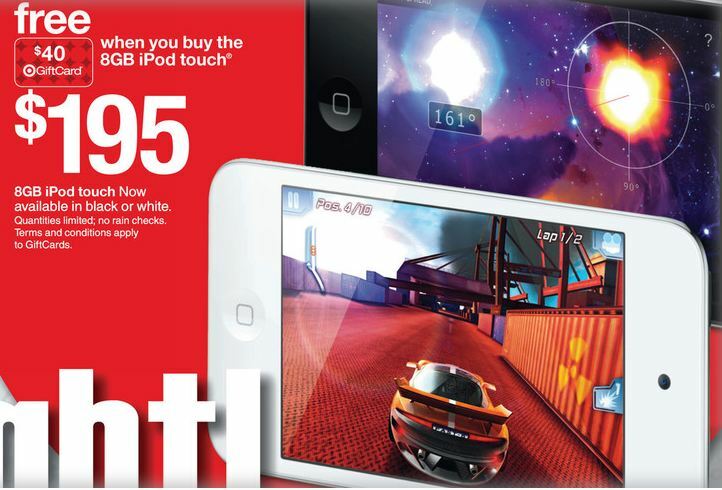 If you’re in the market for either an 8GB iPod touch with iOS 5 or a Virgin Mobile LG Optimus V, or if you just want to buy someone something really spiffy this year, the folks at Target are aiming to make your wishes come true on Black Friday. Provided things go as planned or as I think they might, the time you spend with all those lunatics beginning at midnight/Friday morning will be time well spent when you realize you could possibly leave the store paying only $10 for the Optimus V.
Target is offering a $40 Gift Card with the purchase of an 8GB iPod touch which is being advertised at the unremarkable price of $195. That’s a whopping $4 off the MSRP if you’re keeping score but hey, don’t blame the bullseye for the lame markdown — you know how Apple is. I’ve gotten free Target Gift Cards before and they’ve been pretty lenient about when they can be used. I’ve gone right back in the store and used them or given them to Ann who was behind me in line buying a few items. So, if the aforementioned rules hold true, then all you’ll need to do is bring a friend — or your split personality if you have one — along with you when shopping. You go for the iPod and your friend grabs the phone. Once you have and pay for the iPod and get the $40 Gift Card, hand it off to your partner in crime for redemption on the phone. BOOM! 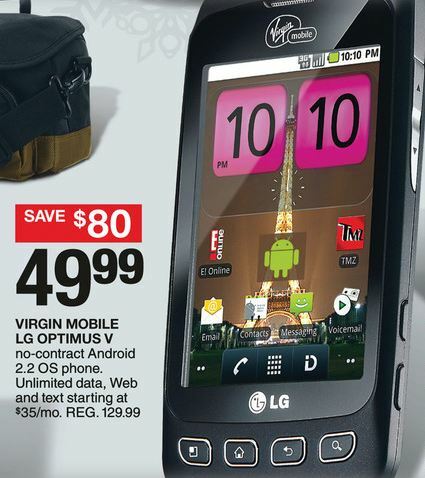 A $10 Android phone! Between the two of you, you will leave the store paying a combined total of only $204 (plus tax, the iPod buyer paying almost all of it). About the only thing you’ll have to do is pay your friend back for the phone, say “Merry Christmas!” and let them have it, or fight it out in the parking lot while a stranger shoots a video of you two and posts it on YouTube with the title, “Two Black Friday Idiots in Target Parking Lot Fighting Over Phone.” Hey, it could go viral. You never know. “Got Android phone for $10 @target. Thanks, holographicmeatloaf.com! @aeromat“. The @aeromat mention is me, of course. And hey, if it does work, give my wife some credit and use her Kickbacks code when you activate your phone: UJWQD9VW. We no longer have a home phone and she’s been burning through her minutes, so help her out! This entry was posted in Computers, Economy, Electronics, Entertainment, Gadgets, Geek Stuff, Money, Smartphones, Technology, Virgin Mobile and tagged black friday, gift card, ipod, LG Optimus V, smartphones, target, Virgin Mobile by Dave. Bookmark the permalink. Nice post but I will leave the Black Friday stuff to the crazy people. As for the burning through minutes, I have figured out how to positively use skype on your android phone and not burn your minutes. Simply turn on “airport mode”, then turn on wifi, then make your calls via skype. I have double checked my minutes a few times to confirm that this does not use my minutes. I definitely won’t be there. No way. Ann uses Skype at home but tends to burn her minutes while at the office or while out. As for me, I use my iPod since the Skype app obliterates most of my phone’s memory even if moved to the SD card.